Milwaukee Bicycle Co. hubs now in 48 hole! 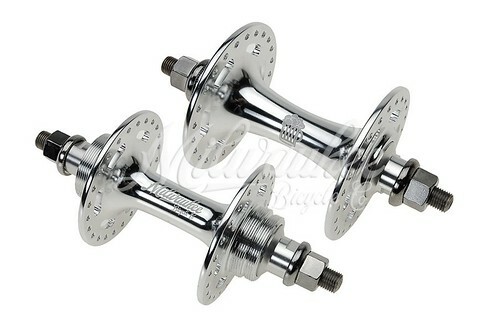 These high-flange track hubs are the newest arrival here at Ben’s Cycle. Just in! Made especially for Ben’s Cycle and Milwaukee Bicycle Co.
• Hi-Flange – with oval cut-outs for that classic look. • Fix/Free Threading – rear hub will accept track cog and lockring on one side and freewheel on the other. • 42mm Chainline – to work with track bikes and converting most road bikes to fixed gear. This entry was posted by Doug D on November 4, 2008 at 2:43 am, and is filled under Bike Polo, Products, Wisconsin. Follow any responses to this post through RSS 2.0. Both comments and pings are currently closed.